The Rustar is a traditional wooden dhow vessel that offers its guests dining and entertainment while cruising along Dubai Creek and taking in the sights of the city. The ship, which is equipped with lateen sails, has three levels; the lower deck has a bar, the middle level features the main dining hall, and the upper level is an open-air dinner deck. A romantic setting for a meal for two but equally popular with families, the Rustar Floating Restaurant has all the luxuries of a five-star establishment. Its lavish interior is made up of predominantly glass and teak wood with typical Arabic designs throughout, and there’s even a small rock waterfall onboard to add to the ambience. Dinner is a buffet of international and continental cuisine, while the live entertainment includes singing, dancing, and other performances. The Rustar Floating Restaurant experience lasts for two hours and bookings should be made in advance. There are various types of tours to choose from, some of which include roundtrip transfers from selected Dubai hotels. The Rustar leaves from the landing at Deira Creek and boarding usually begins at 8pm, with the cruise departure scheduled at 9pm. Did You Know? The Rustar dhow can accommodate 400 passengers. At 51 meters long, it holds the world record for the largest floating restaurant. 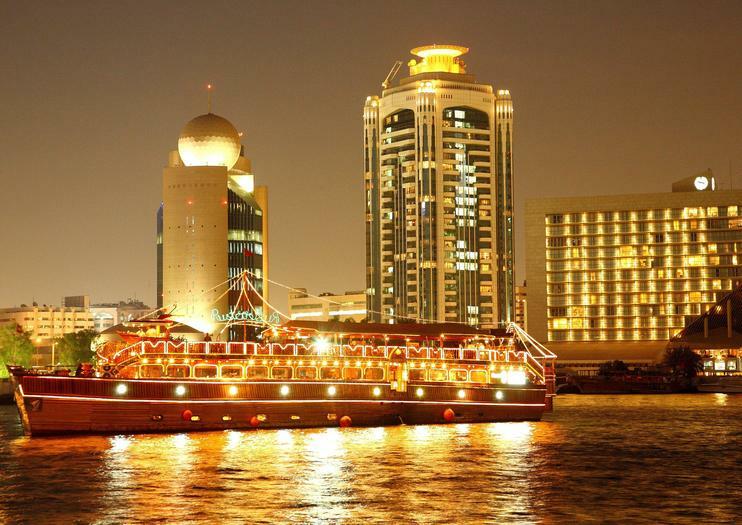 Make an evening in Dubai extra special with a 2-hour Dubai Creek dinner cruise on the world's largest ‘dhow’— a traditional Arabian boat. Step aboard the beautifully illuminated Rustar floating restaurant, and admire Deira’s sparkling landmarks over a sumptuous dinner buffet. Settle on the outer deck or in the elegant cabins, and savor international and Emirati dishes prepared by the 5-star Movenpick hotel as you pass the floodlit Rolex Towers, souks and other landmarks. As you dine, enjoy an array of entertainment, including traditional Emirati dance shows and live music. Visit Abu Dhabi, the capital of the United Arab Emirates, on a day trip from Dubai that takes you to the city’s two top attractions—Sheikh Zayed Grand Mosque and Ferrari World. Marvel at the opulent design of the enormous mosque before heading to the Ferrari-themed amusement park on Yas Island, where you can enjoy exciting rides, including the world’s fastest roller coaster. Ring in the New Year in an unforgettable way in Dubai. You’ll sail aboard the world’s largest wooden dhow along Deira Creek under the glittering decorations put out to celebrate the beginning of another year. Take a turn on the dance floor, watch the live Ayala and Tanoura dancing, enjoy a view of the fireworks and the company of other revellers on this fully licensed venue. Spend three hours venturing into the dunes outside of Dubai on this epic morning safari. You'll visit a typical Bedouin farm and bash the dunes on a thrilling 4WD ride. Ride a camel, sand board and make the most of your desert adventure.This all-inclusive tour showcases the best of desert life and is the perfect way to spend a day outside of the city.